More shenanigans are afoot from your favorite mental patients Mike Moffatt and Jason Stoddard at Schiit Audio. 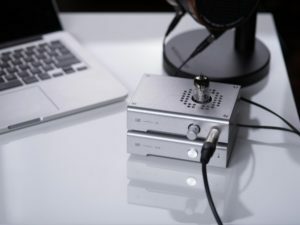 The first installment of my two-part review covered the new Modi Multibit DAC, and now I’ll discuss the second part of my headphone kit, the Vali 2. This little bugger has to be one of the most inexpensive American-made tube hybrid headphone amps on the market right now. 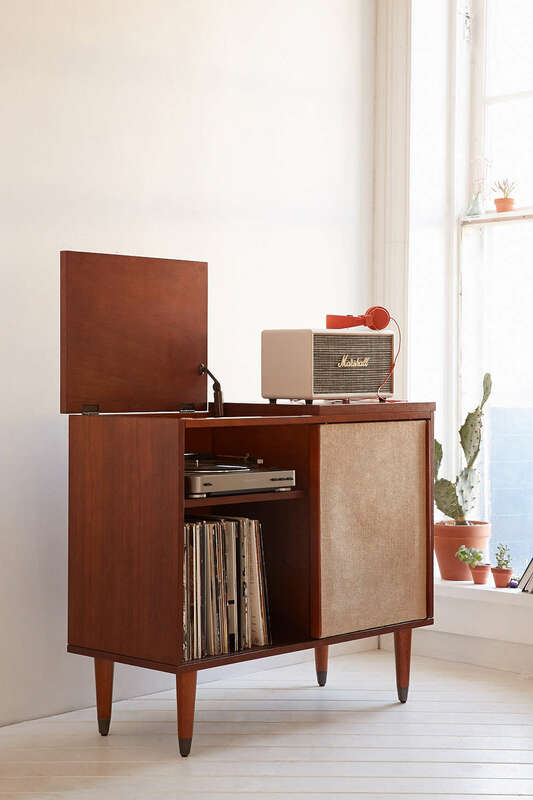 Retailing for $169 will put this within reach of the vast majority of audiophiles, and it’s not just a “for the money” product. This is the first legitimate audiophile-quality headphone amp I’ve owned that allows the user to easily tube-roll and try out different various vacuum tubes to more finely dial in your sonic tastes. Let’s look at the specs a little. Frequency response is a standard 20Hz-20kHz. It puts out 1000 mW per channel at 32 Ohms, and 470 mW at 300 Ohms. 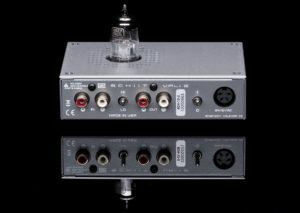 See the Schiit Website for more details on power output. The unit is powered by a wall-wart switching power supply, both for the tube and bipolar components. 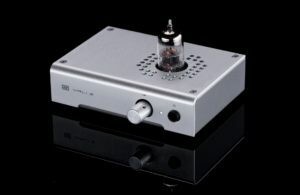 The real news for tube-lovers is that Schiit claims this class-leading power supply provides 60 Volts on the plate. The tube-rolling in which one may partake with this device means you can get just as silly and mental as the Moffatt/Stoddard squad did when they made this little dude! To get an idea of what the Vali 2 sounded like with the stock 6BZ7 tube, I fall back on the old trick of pulling up a track with which I’m intimately familiar. I also think it helps that the reader is as well; no purloined reel-to-reel original John Williams score to The Three Amigos here. So, being a child of the Eighties, I went with the iconic MTV track, Dire Straits “Money for Nothing” off Brothers in Arms. The intro of this song should be familiar to our dear readers; I know I’ve heard the damn song at least three hundred times. I am a HUGE Knopfler fan, as he basically taught me how to play guitar, but weirdly enough I don’t know how to play this one. He’s playing a Les Paul (while he was almost pathgnomonically known for using a Strat) and maybe that threw me off. That said, I know the melody and rhythm by heart. I can hear the reverb of the synth slowly build in volume, I can hear Sting whisper in the background “I want my MTV”, and then as it continues to build, the reverb and artificial sounds abruptly stop and one gets struck with Knopfler’s overdriven Les Paul mixed between bridge and neck pickups, using his signature fingerpicking style to blow us all away with such an iconic riff. I hate to steal a cool phrase from a weird dude, but this tube combo definitely has a “Wall of Sound” quality to it. The 60 Volts to the plate are clearly making a difference here, because the attenuator couldn’t go past about 40% without giving me hemotympanum and causing the dogs to call 911. All in all, the stock 6BZ7 tube works quite well with this amp. I’d recommend this tube for hard rock, grunge, or classic rock. When rolling on the Electro-Harmonix 6922 (which by the way is an extremely easy plug-and-play scenario) I wanted to find music to match what I’ve heard is supposed to be a very smooth, clean and bright tube. I chose to listen to Donald Fagen’s excellent solo debut album, The Nightfly. Several of the tracks on this album complement the 6922 combo, but specifically the opening track “I.G.Y” really allows the EH tube to shine the way it should, really fleshing out mid-range with Fagen’s cool but quirky vocals, and allows Marcus Miller’s bass work to hold down the clef with its sharp chiseled weight. The soundstage on this particular tube struck me as quite nice, probably the nicest of the three. This tube would do quite well while listening to jazz or classical, where the smooth clean sound can prevail and the soundstage would assist the listener to really get some very cool instrument placement. The last tube I tried out in the Vali 2 was the Genalex Gold Lion ECC88, again from Bezos et al. At $44.99, it was almost double what Jeff charged me for the EH, so I was in a confrontational mood when pushing this delicate but overly priced piece of audiophilia into its socket. I guess by now you know I’m a Rush freak, so I threw on “Subdivisions” from their excellent 1982 release Signals. The post-Moving Pictures albums can get a little lost in the fray sometimes, but I find this phase of their discography just as exciting, albeit even heavier on synth. The Gold Lion did a very stand-up job with Geddy Lee’s difficult bass work and kept it separated, not muddied up. Weirdly, as a guitarist, you’d think this song would put me in the pro-Lifeson camp and want to chuck the synths in the dumpster, but I have to say that the Gold Lion was able to breathe some life into a track I’ve heard hundreds of times. Tube-rolling with the Vali 2 was a fun little experiment, and for audiophiles looking to get into this little micro-addiction this is a very easy place to start. For $169, you’re not likely to find another similar component built to such exacting standards; one wonders if Schiit runs in the red or is simply a money-laundering front for a Bond film Megalomaniac. Either way, you win, with inexpensive tubey goodness.